It seems that controversial, and sexual, art is once again getting people riled up in France. 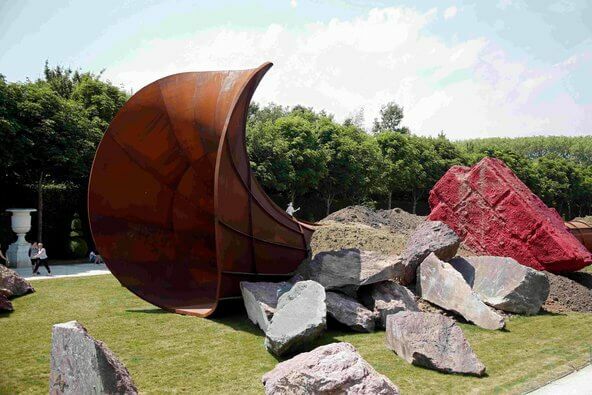 The latest victim of critics vandalism is “Dirty Corner” by sculptor Anish Kapoor. While the artist claims he has never referred to the piece as “The Queen” many media outlets have quoted him as stating the piece represents a queen baring her private parts. Perhaps that interpretation combined with the location, the former home of Marie Antoinette, a queen famous for her insensitivity to the public, was more than the critics could stand. Authorities moved quickly to clean the yellow paint from the 200-foot-long steel work, which is part of a free exhibition at the French palace that started June 9 and will end in November. The sculpture, titled “Dirty Corner,” is surrounded by large, jagged rocks, some painted in red. By Thursday afternoon, authorities said that workers were still cleaning the sculpture in the middle of Versailles, once home to France’s 18th-century queen, Marie Antoinette. You’ve Never Seen Snow Like This Before!